My 2001 Lazy Daze came out of the factory with the optional solar package that was available at the time. 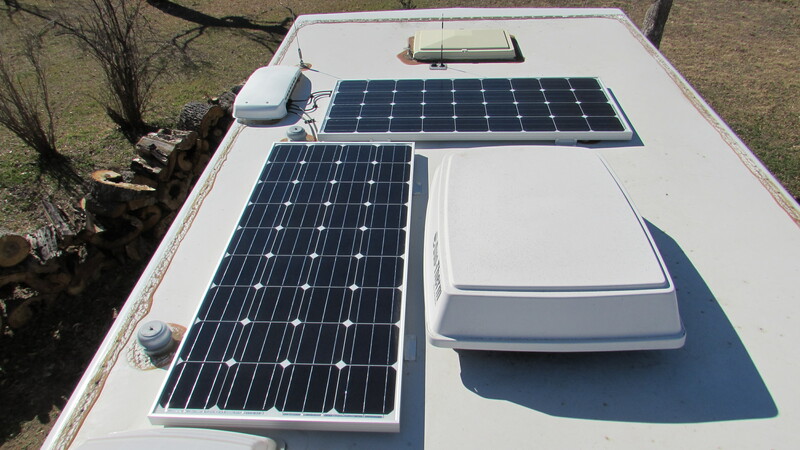 It had one 85-watt BP Solar panel and a Heliotrope RV-30S charge controller/monitor. 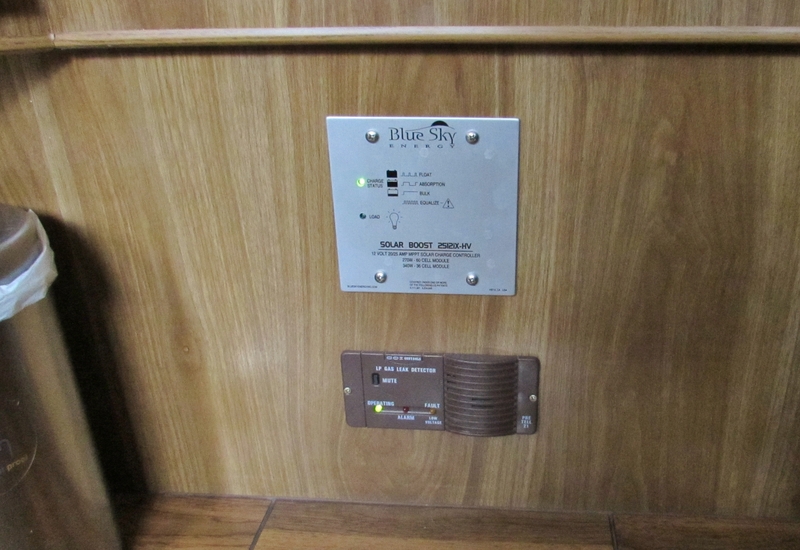 The system helped to charge the batteries a bit, but wasn’t great for the serious boondocking that Riley and I like. I needed a solar system like my dad and I put in the prior rig. When I got back to Texas in November we talked through the project, deciding what to do the same as last time and what to change. Having a bit of experience helped. Having a different floorplan didn’t. We realized the prior 22′ twin-king floorplan was a super simple setup. 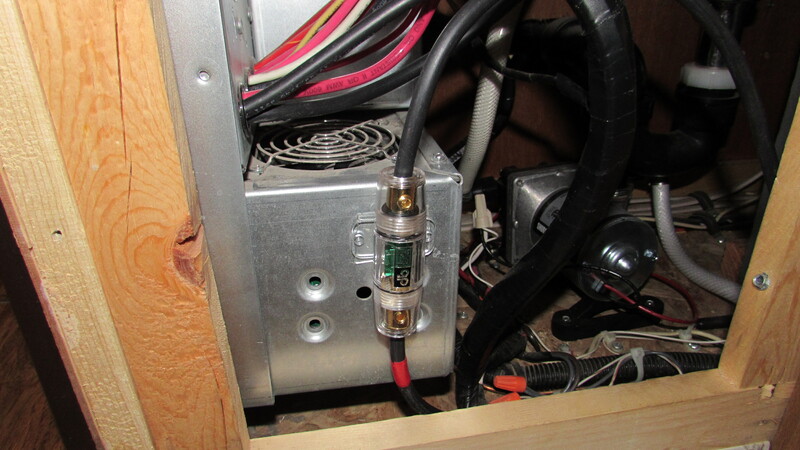 The wires could come from the roof down the fridge vent, straight into the battery box below (and below that to the extra battery set in the old generator compartment) and then to a cabinet directly inside where the controller, monitor and inverter could be housed. 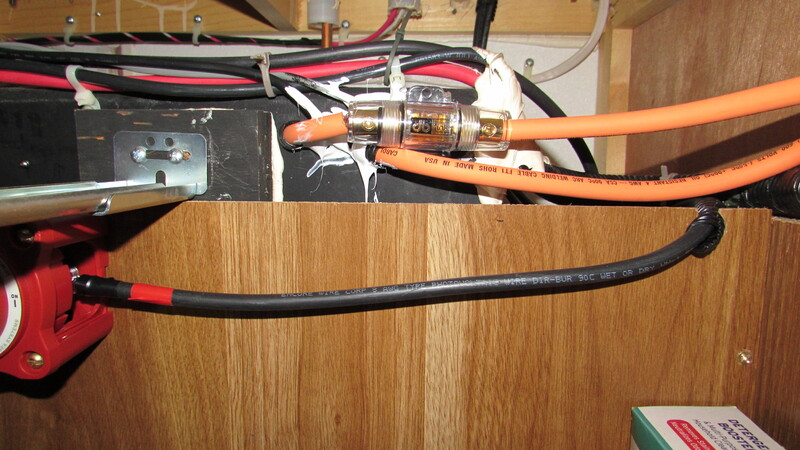 In this 2001 RV we would have to pull at least part of the existing wire and route new. First things first, I ordered the panels, controller and monitor in December. Last time I got the panels with wiring harnesses from AM Solar, a great company for solar. But, I noticed they use Grape Solar panels, which I had seen for sale on Amazon. 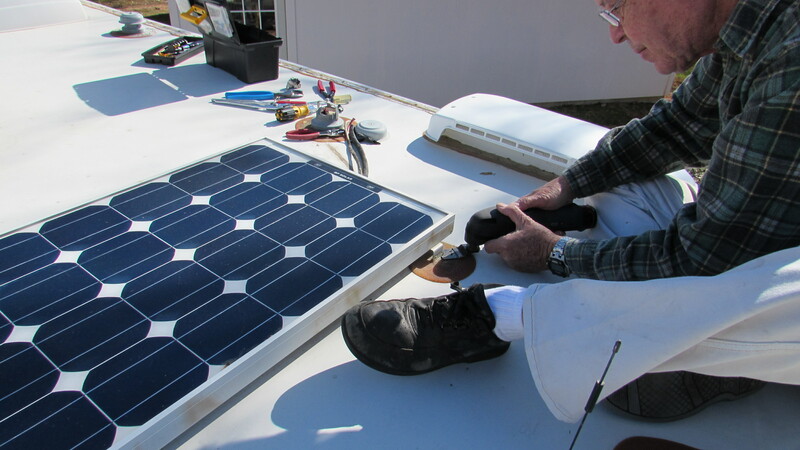 This time I looked at the Grape Solar website and scouted out their dealers for a good price on panels. Eventually I settled on two 160 watt panels from Home Depot (Amazon was out of stock on the 160’s). Turns out that Home Depot sells them, but they are actually shipped directly from Grape Solar. My dad removed the old panel with a small power saw. He just cut off the mount, rather than removing the goop and taking the mounts off completely. The new panels would cover these spots anyway. 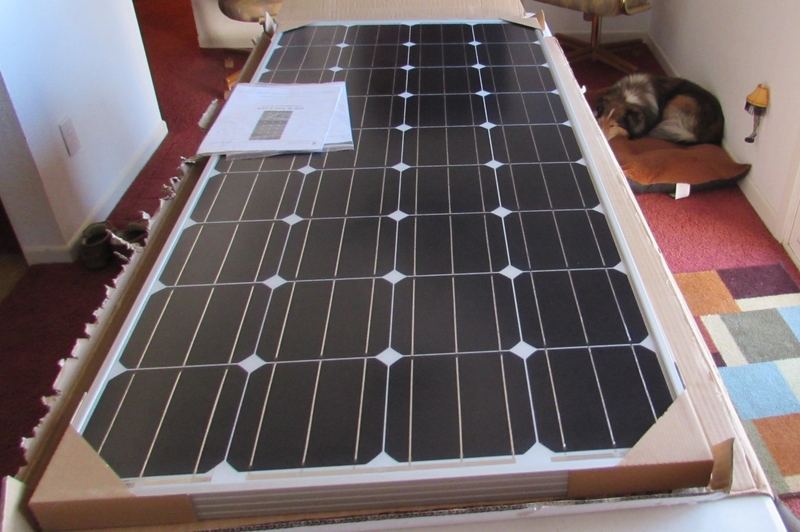 The AM Solar panels we used last year came with wiring harnesses and mounting hardware, but I was able to buy that stuff separately from Amazon this time. I did get the charge controller and monitor from AM Solar, as they had the best prices on the ones I wanted. Also, they have a good combiner box for the wires on the roof to go into the fridge vent. 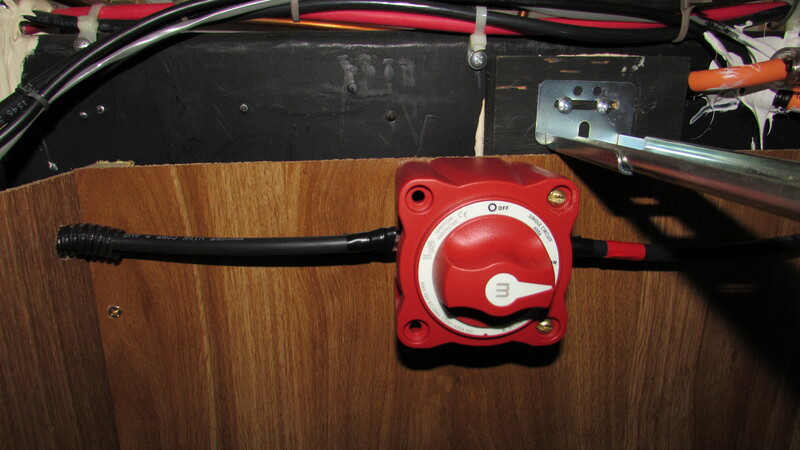 The original charge controller/monitor was located inside on the side of the cabinet above the kitchen sink, directly across from the entry door. The wiring to the solar panel went from there, through the cabinet, behind the microwave and through a hole in the cabinet next to the fridge. They came out on the roof through a vent cap, the same type used for the black and grey tank vents. We removed those wires and put back/sealed up that cap. The wires from the controller to the power center and batteries went the same route, but to an area behind the fridge to go down towards the floor. 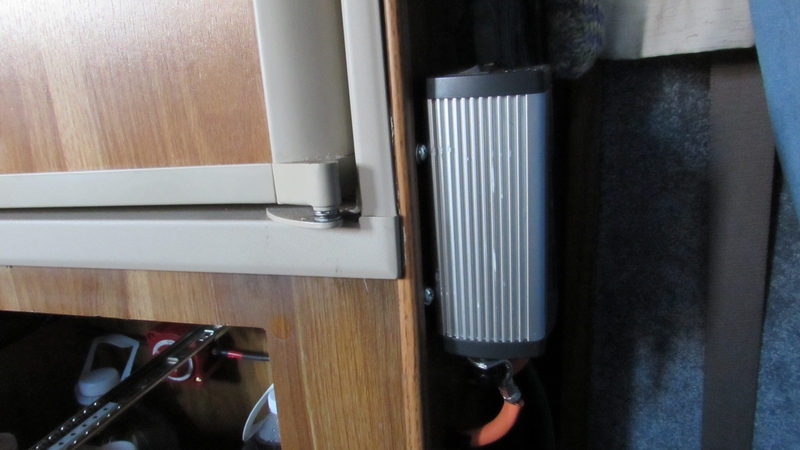 The battery box is directly below the fridge and the RV power center is under the kitchen sink. After thinking of how to use the existing wire or run new, we decided we didn’t want to pull out the fridge to run wire back there. Instead we put the new controller under the kitchen drawers, in between the power center and the battery bank. It would be easier to abandon the original wiring and run everything down along the floor. We were able to drop the wires down the fridge vent, to the access panel on the outside of the rig, and inside through the back of the battery compartment. Under the fridge inside is a drawer and cabinet. By pulling out the drawer we were able to get in there to work on the wiring. Also, I decided to add an on/off switch, so I could easily disconnect the power from the panels if needed. Wires come in from the battery box (the black part) and to the left towards the charge controller. The orange wires are for an inverter on the right side. The white stuff is Dicor to seal holes. The positive wire runs through the on/off switch. The fresh water tank is behind this wall above, under the oven and kitchen drawers. There is about 4-5 inches of space between the wall and the tank, so we were able to attach the controller and run the wires along the floor inside there. I rarely have to look at the charge controller, so it can reside near the floor. I’d rather have the monitor at eye level. For the battery monitor I purchased a Blue Sky IPN-ProRemote. It’s the same kind Chris had and seemed like a good one. Also, it’s made to work well with the Blue Sky 2512 charge controller. We decided to mount in in the space where the old charge controller/monitor was. There was a large hole in the padded side of the cabinet where the original controller/monitor was, so we had to create a mounting plate since the new monitor was smaller. We made the piece below from some 1/4″ scrap my dad had and stained close to the color of the other wood. New monitor and mounting plate. We put the fuse for the controller on the side of the power center, just inside the access panel door. On my prior rig I had a 2000-watt Xantrex inverter. It worked great. I could even run my microwave and toaster from it (for just a minute or two). But, that seemed like overkill since I have a generator on this rig. I already had a 400-watt inverter on hand that I had bought to charge my laptop, so we decided to use that. If I decide it’s not enough power, I can get a larger one later. 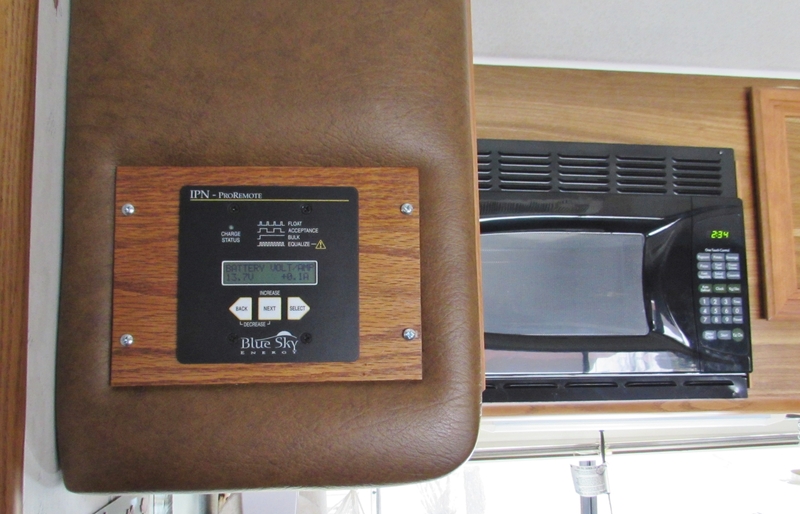 We mounted it on the side of the wall next to the refrigerator, behind the driver’s seat and across from the dinette. It’s about 2 feet from the batteries there, which is good. And I can use it for charging stuff up front. (I have a 150-watt inverter in the back, mounted in the old TV cabinet, plugged into an existing 12-volt plug.) 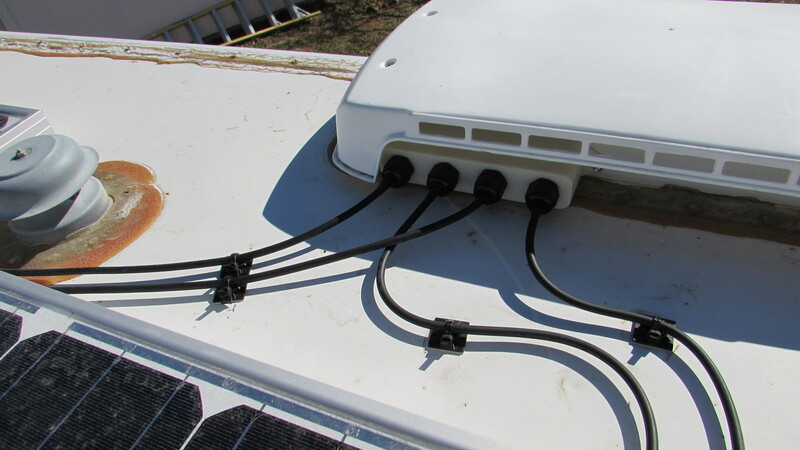 Because I’m not sure the 400 watt inverter is going to be enough, we used big wire – 2/0 welding cable – so that I can easily upgrade later without having to rewire. That’s the orange wire seen in the wiring picture above. Inverter mounted next to the fridge. The parts we used are gathered in the Amazon store I put together of the items I use in my RV – Amazon. All together the system and parts cost just under $1,200. Plus, the inverter was about $25 when I got it last year. And, I can’t thank my dad enough for doing this project. He finds it fun (25+ years as an IBM Electrical Engineer, this is his kind of thing), but I really appreciated all his time and efforts. Next up, the last of the major projects my dad and I completed – a new pantry closet.